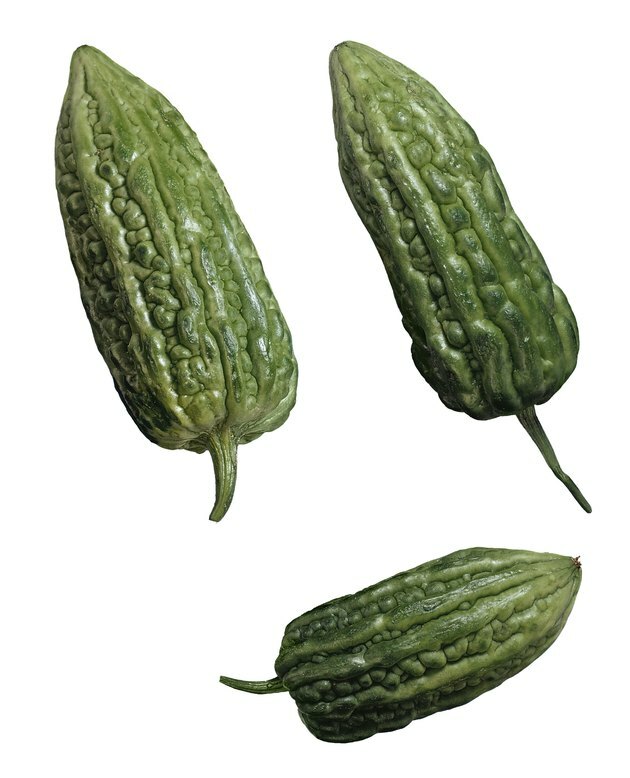 The astringent, good-for-you leaf tips of the bitter melon, called ampalaya in the Philippines, kerala in India and balsam pear in China, provide calcium, potassium, vitamin C, folate and vitamins A and K, while the warty-looking pods also provide choline and lutein+zaxanthan. People either love or hate bitter melon, with children more likely to dislike the strong, astringent flavor, while adults, with more mature palates and a better understanding of its healthy properties, relish its appearance on their plates. Both raw and boiled bitter melon gourd leaf tips and their raw pods have no choline at all. Boiled bitter melon pods contain 13.4 mg of this essential nutrient per 1-cup serving, however. The body uses choline to maintain cell membranes and make betaine, acetylcholine and low-density lipoproteins. Betaine reduces homocysteine levels, which are a risk factor for heart disease, and keeps the liver from developing fat deposits. Cooked bitter melon pods provide 1,641 mcg of lutein plus zeaxanthan. The raw pods provide only 158 mcg of lutein plus zeaxanthan, while the leaf tips provide none at all, raw or boiled. Lutein and zeaxanthan act in tandem to protect the eyes against macular degeneration due to retinal damage and protect the skin against sun damage from ultraviolet rays. Boiled bitter melon gourd leaf tips provide almost 95 mcg of vitamin K, while boiled pods have just 6 mcg. Vitamin K causes blood to clot and speeds wound healing. People taking warfarin -- an anticoagulant -- should avoid eating boiled bitter melon leaf tips, but can safely eat raw bitter melon leaf tips and raw or boiled pods. Both raw and boiled bitter melon leaf tips provide significant amounts of calcium and vitamin A. Boiled tips provide more vitamin A, needed for eye health, while raw tips provide more calcium. Boiled bitter melon gourd pods provide less than 1/3 the calcium of raw leaf tips. Raw bitter melon gourd pods provide less than half the calcium of raw leaf tips. Boiled bitter melon gourd pods contain 396 mg of potassium, while raw pods have just 275 mg of the mineral. Potassium works with sodium, chloride and magnesium to maintain the body's electrolyte balance. Too little potassium -- called hypokalemia -- causes weakness, lack of energy, muscle cramps, stomach disturbances and irregular heartbeat. Raw bitter melon pods provide the most vitamin C, at 78 mg per 1-cup serving, as well as the most folate, 67 mcg per serving. Folate protects against fetal neural-tube defects such as spina bifida. Despite its high folate content, pregnant women should not eat bitter melon gourd due to the risk of miscarriage. VeganHealth.org; Choline; Jack Norris, R. D.